We are very proud of being at the heart of the community and we work closely with various organisations both on site but also further a field in order to widen our networks, all of which contribute to driving our provision and school improvement. Our geographically closest high school, Leeds Jewish Free School share the campus with us. Though a distinct organisation, separate from the primary school, we work very closely with LJFS, sharing the facilities, accessing joint training and there is also some cross over of staff. A youth club that also share the campus with us and access shared training. The Zone provide after-school provision and also work with us to provide pastoral support for families through their trained staff and community contacts as well as working with children during the school day. We are the home ground for our youth football team, run by parents of the school and members of the community. They have been influential in securing funding for the recent drainage system on our school fields. Scouts and Guides meet at the school every week, participating in both indoor and outdoor activities. The Leaders are parents/grandparents and members of the community and the majority of the children attend Brodetsky. JNF UK is Britain’s oldest Israel charity and has supported the Zionist pioneers since the days of the Second Aliyah. Today they are working to ensure that the people of Israel who live in the underdeveloped south of the country can also share in the Jewish State’s success story. In 2018, JNF awarded Brodetsky Primary School a grant to support the Ivrit and Israel education at the school. Click here to read the ‘Education Grants Letter for parents from chair of trustees’. UJIA is the key funder for youth movements, Israel Experience Tours, University programmes and has been for more than two decades. As well as investing in other Leeds based projects, UJIA continually support Brodetsky enabling us to focus on different areas of our school’s development with regard to our informal Israel education. They have helped us ensure that modern Hebrew is offered to all children in our school to the highest possible standard. UJIA have also allowed us to increase our children’s exposure to the Hebrew language and Israeli culture by funding the Shinshinit programme alongside the Jewish Agency for Israel, whereby an 18 year old student from Israel is brought over to the UK in order to work in our school for the year. Through the UJIA Living Bridge School to School partnership we have also formed a strong bond over the last 10 years with a school in the Galil, the North of Israel named Hemed. The children connect by sending each other cards and letters, hold video conferences, do pieces of artwork together and we are fortunate to hold staff meetings twice a year at the school in Meron H’Galil in Israel and here in Brodetsky. We are part of the Alwoodley, Roundhay and Moortown cluster. This means that we work as part of a large group of schools who contribute towards a joint funding arrangement and can then access extended services such as Play Therapists, Educational Psychologists, Counsellors, Inclusion Workers, Family Support and much more. We are part of an alliance of primary schools where we access joint training in order to drive continuous improvement in our school. Our senior staff, including our Special Needs Co-ordinator regularly attend meetings as well as our subject leaders in English, Maths and Computing. This is a good way to network and share ideas. Springboard is the teaching alliance we are part of, consisting of a diverse range of schools in both inner city and sub-urban Leeds. We provide school-based teacher training for PGCE students from Leeds Beckett University. Jointly we have successfully trained teachers to a high quality standard- some of whom are now employed by the schools within the cluster – including ourselves. We see ourselves as being proactive and are committed to the training of future teachers in order to produce a strong workforce for the future. As well as Leeds Beckett, we work with a range of other universities and are a reputable school, known for the high quality support and training we provide. We also are part of a joint collaboration of schools across wider Leeds, focusing on different areas of school improvement. The focus over the last 2 years has been on assessing writing. We have done a lot of work as a collaboration which has included within school and across school moderation of writing. Some of this work has allowed us to access Local Authority Improvement Adviser training and support around the assessment of writing. For the last 3 years we have been involved in an inter-faith project with a local Church of England school in order to promote community cohesion, tolerance and respect for other faiths and cultures through art. This has involved the children of both schools working together on various projects, which they have all embraced and are enjoying. Every year we participate in the Bronze Level Arts Award which starts in Year 5 and continues into Year 6. Over the 2 years, children produce a portfolio of evidence showing the range of Art and DT skills they have learnt over the years. Our very talented Art Teacher, is a qualified Arts Award Assessor and a sample of portfolios are sent off to be externally moderated. We always showcase the portfolios to families to show them how proud we are of the work that is happening in school and how skilled the children are! We spend our P.E funding on sourcing professional coaches to deliver one of our weekly P.E sessions across school whilst also up-skilling the teachers as they participate in the lessons. We are very lucky to be an Active School which means that we can access a range of city wide competitions for both competitive and non-competitive sports. These are for all children, sometimes focusing on vulnerable groups. As an Active School, our P.E leaders in school can also access a range of training in order for them to come back to school with new ideas and initiatives that will have a positive impact on the physical activity levels of our children. LJOY (Leeds Jewish Orthodox Youth) is an organisation who provide informal Jewish Education to young people in Leeds. The LJOY Co-ordinator will often come into school to take part in special assemblies and runs an educational programme on a Lunch time for Years 5 & 6. Streetwise is an organisation that has worked with us for many years, supporting us with our PSHCE curriculum. They provide workshops for children across school in E-safety, Friendships, Anti-Bullying, Body image and Transition to high school. We have very close relationships with our local PCSO’s who play a very active part in our school life from monitoring parking to educating children about road safety and E-safety as well as running parent workshops about online safety. PaJeS and the Jewish Schools Network provide services for our governors, parents and support staff as well as for teachers and school leaders. With the running of Headteachers conferences, governor training, curriculum development, teacher training workshops, clusters and forums and publications, their vast variety of support and network opportunities allow our Jewish Studies department to continue in its professional development. 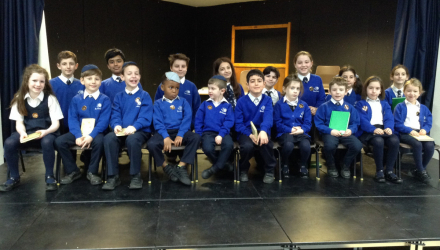 The Talmud Torah together with LJFS offers our ex-students in Year 7 the opportunity to join their highly sought after Bat Chayil Programme which takes place on our School Campus.